Home » Almighty God , God's will , God’s disposition , the church of Almighty God , the kingdom of heaven » Listen! Who Is Speaking? Being a preacher of the Three Grades of Servants Church, I felt quite helpless when seeing that fewer and fewer brothers and sisters came to the meetings. I had prayed to the Lord countless times, asking Him to strengthen the faith of the brothers and sisters, but the desolation of our church didn’t change at all, and even I myself was mired in weakness. … One day, when I was doing the housework, two co-workers of our church, Brother Wang and Brother Lin, came. Seeing them, I was happy and let them into the room. After an exchange of greetings, Brother Wang said, “Sister Zhou, how is your spiritual condition?” I gave a sigh and said, “Don’t mention it. I’m weak and have nothing to preach in the meetings. The brothers and sisters are also passive and weak, and there are only a few left in the church.” At this, they looked at each other, and Brother Lin said, “Sister Zhou, do you know why we are no longer able to preach, and why there are only a few believers left in the church?” Hearing that, I thought, “This is just what I want to know. Do they know the reason?” So I asked quickly, “Why?” Brother Wang said, “Because the Lord has come back and become flesh for the second time to speak and carry out new work. Many brothers and sisters have accepted God’s new work and have lived in the stream of the present work of the Holy Spirit, and their condition is growing better. We also should hurry up and follow God’s footsteps!” His words reminded me of what our senior co-workers had said, “If anyone preaches that God has carried out new work and expressed new words, he has departed from the Bible. 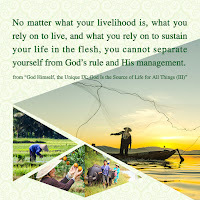 Departure from the Bible is not belief in God, but is deviation from the Lord’s way, and is apostasy.” As I thought of that, I said gravely, “Haven’t our senior co-workers told us many times that departure from the Bible is not belief in God? You should have remembered it. Departure from the Bible is departure from the Lord’s way. You are so bold to preach that to me.” As I spoke, I got up. At the time, Brother Lin said, “Take it easy, Sister Zhou. We know you are a true believer of God and pursue hard, so we preach God’s new work to you. You should examine it carefully, and not miss this opportunity! …” I raised my hand before he finished his speaking, and said, “Stop! Stop! Don’t talk about it anymore. I won’t believe in whatever departs from the Bible. You gave up the Lord’s way, but I will hold it fast.” Seeing me obstinately refuse to listen, they had to leave. After that, they came a few times, but I gave them the cold shoulder. Afterward, I read these words of Almighty God: “For many years, people’s traditional means of belief (that of Christianity, one of the world’s three major religions) has been to read the Bible; departure from the Bible is not the belief in the Lord, departure from the Bible is an evil cult, and heresy, and even when people read other books, the foundation of these books must be the explanation of the Bible. Which is to say, if you say you believe in the Lord, then you must read the Bible, you must eat and drink the Bible, and outside the Bible you must not worship any book that does not involve the Bible. If you do, then you are betraying God. From the time when there was the Bible, people’s belief in the Lord has been the belief in the Bible. Instead of saying people believe in the Lord, it is better to say they believe in the Bible; rather than saying they have begun reading the Bible, it is better to say they have begun believing in the Bible; and rather than saying they have returned before the Lord, it would be better to say they have returned before the Bible. In this way, people worship the Bible as if it were God, as if it were their lifeblood and losing it would be the same as losing their life. People see the Bible as being as high as God, and there are even those who see it as higher than God” (“Concerning the Bible (1)” in The Word Appears in the Flesh). These words touched my heart. “Aren’t they directed at me? I have been holding to the Bible like this since I began to believe in the Lord. I see the Bible as my lifeblood. Every time after I read it, I put it on a high place beyond the reach of my children. I consider it above everything else, and even think that departure from the Bible means betrayal of the Lord. But, am I wrong?” I read on with a seeking heart, from “Concerning the Bible (1)” to “Concerning the Bible (4).” The more I read, the more I became enlightened. Almighty God’s words made me completely understand this: Actually, the Bible is nothing more than a historical record of God’s work, a testament to the previous two stages of God’s work. The Old Testament records Jehovah’s work from the time of creation until the end of the Age of Law, and the New Testament records the Lord Jesus’ work in the Age of Grace. God’s work is always new and never old, and is ceaselessly progressing onward. Today God has done a new stage of work outside the Bible—the work of the Age of Kingdom, which is the last stage of God’s work of saving man. These three stages of work are done by one God. “That’s right!” I thought, “God is so almighty, so wise; it is impossible for Him to have just done the limited work recorded in the Bible. Besides, I have personally seen from Almighty God’s words that God’s words and work in the last days do not deny the Bible, but become higher and deeper on the basis of the work of the Age of Law and the Age of Grace recorded in the Bible, and are more in line with man’s actual needs. 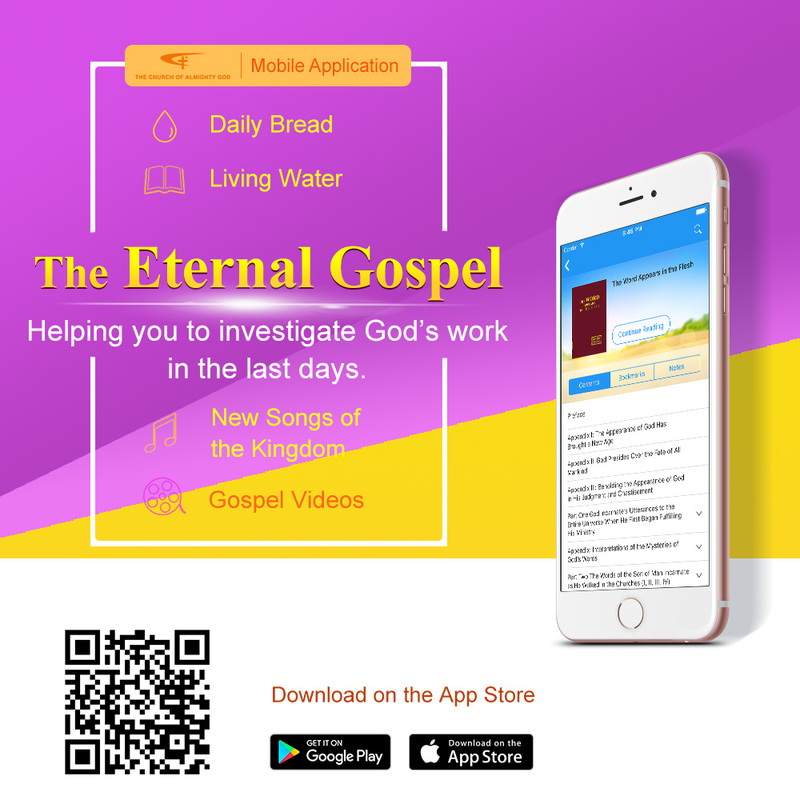 It is just as this passage of Almighty God’s word says: ‘You must understand why, today, you are asked not to read the Bible, why there is another work that is separate from the Bible, why God does not look for newer, more detailed practice in the Bible, why there is instead mightier work outside of the Bible. This is all what you should understand. You must know the difference between the old and new work, and even though you do not read the Bible, you must be able to dissect it; if not, you will still worship the Bible, and it will be difficult for you to enter into the new work and undergo new changes. Since there is a higher way, why study that low, outdated way? Since there are newer utterances, and newer work, why live amid old historical records? The new utterances can provide for you, which proves that this is the new work; the old records can’t sate you, or satisfy your current needs, which proves that they are history, and not the work of the here and now. The highest way is the newest work, and with the new work, no matter how high the way of the past, it is still the history of people’s reflections, and no matter its value as reference, it is still the old way. Even though it is recorded in the ‘holy book,’ the old way is history; even though there is no record of it in the ‘holy book,’ the new way is of the here and now. This way can save you, and this way can change you, for this is the work of the Holy Spirit’” (“Concerning the Bible (1)” in The Word Appears in the Flesh). At that moment, I was suddenly enlightened: Now I know why I have grown increasingly passive in spirit although I have held to the Bible all the time and why my brothers and sisters have become ever weaker and some of them have even stopped attending the meetings although they haven’t departed from the Bible under my leading; why those brothers and sisters who have accepted the kingdom gospel of Almighty God are full of faith, and no matter how I have treated them, they are not disheartened but still come to preach the gospel to me again and again. The reason is this: What I have held to is the old way and I have long lost the work of the Holy Spirit; whereas the brothers and sisters of the Church of Almighty God are guided by the new way and watered by God’s new words, thereby gaining the work of the Holy Spirit. This is how the new way and the old way differ. Disclaimer: This article on our website is original. If you wish to reproduce it, please indicate that we are the source. What does the social trends bring to people?